You could miss this place if you turned into the wrong street. Wanting to do an alfresco this time round seemed almost an impossible task as we were bombed by the loud drills coming from a construction site opposite, coercing us to retreat back in the restaurant. We saw another table do the same before deciding to follow suit. This was my second time returning this branch and I must say that my tummy and I were the most happy when the meal ended. The bread and the olive tapenade (i guess) did just the thing that they were supposed to do. Fill our tummies and boosted our appetite for what's going to follow next. Calamari seemed like a good choice because we had a tasting of it the last time. It came with 2 additional prawns. This has got to be the thinnest battered calamari. No kidding. 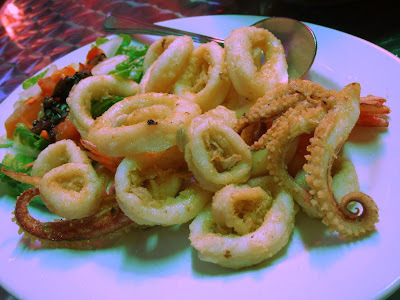 The batter is just a mere thin case of crispy batter and this batter has got to be the tastiest of all of those (calamari fritti) that I have tasted. Not that I tried a lot. The tentacles were just pure pleasure as I sinked in my teeth in one of those babies. This made me smiled a lot and I can't wait for more food to come. Fish soup was good but in a way, it didn't come across as full bodied as the one I had at the Changi branch. Savoury and not overwhelmed by the tomatoes, this was one heck of a fish soup. Finally, the pasta! The prawn penne with cream tomato sauce did it for me. Although it was a tad al dente, the cream sauce and the fresh prawns were so good that I did not think about anything else (except the calamari). Stuffed tortellini with beef sauce. The assumption that it would be a tomato based pasta proved to be correct except that it was not how I had envisioned it to be. There were plenty of minced beef and a smidgen of tomato sauce. I think the tortellinis was stuffed with cheese. I would come back for this dish too. Although their tiramisu was not the best, I like them because it is very simple and palatable. Not too fanciful and something sweet to end the wonderful dinner is always a plus. This time, it is all mine! Mom cooked fried rice with preserved meat for me with a side of egg with runny yolk. Every mouth was filled with chunks of juicy lup cheong. The egg yolk just made this whole dish heavenly. Aloha! 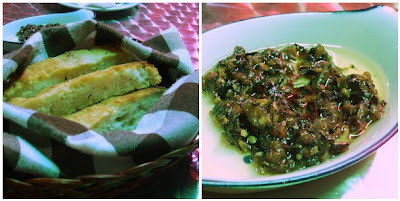 It has been sometime for a real post for what I had eaten for lunch. I forgot to take pictures for some of them and I promise to do a real documentation of what I am eating in future. These are quite random pictures. things like miso soup from those miso paste sachets I got from Isetan Scotts. Mini portobellos with scallions and XO sauce. These were excellent. The XO sauce has lots of scallops which helped in the flavouring and olive oil as the healthy fat in my diet did help in making the salad tasty. This warm mushroom salad is light on the palate and will definitely make you want to eat more. Yes...repeated ingredients are being used here but this was the best that I could manage. I used Greek yogurt here. A note to myself: next time use less chives. You can top this up with cashew nuts and it will be a filling and healthy lunch. Updating some overdue entries. I remembered wanting to return at the end of the meal so it meant that the meal was enjoyable. Not entirely so but I'll get back on that. I like this ambience of this place. Reminds me of Porta Porta. We got a starter to share, 2 pastas and a dessert. I wanted the calamari because I have tried better ones and had a strong craving for this dish for some time. In this case, I would prefer Da Mario's version as the batter was tastier. This was also not too bad as the spicy arriabata sauce enhanced the taste of the squids. Luckily, this was not the rubbery chewy type so I enjoyed this quite a bit. The ravioli stuffed pumpkin and coated with capsicum cream was brilliantly executed. I could taste the capsicum in the saltish cream and the ravioli was cooked just right. The pumpkin filling was like a delicacy to me because it tasted real (i.e no fillers) and it was sweetish. Making this more like a dessert pasta dish. Finally, on to the dessert which I find it not too good. Maybe because of the description that was stated in the menu. "Mascarpone and ricotta apple pie" have certainly caught my eye but when served, I could not taste or see any cheese element in this dish. The chunky apples were a bonus but they were not sweet at all. It just came very hot. The ice cream came very cold. This yin and yang dessert was not something that I would order again.